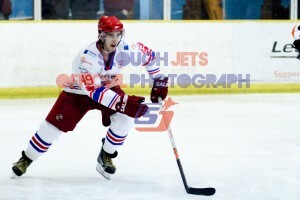 Slough Jets rested Ales Padelek to allow Andrius Kaminskas to ice against the physical Sheffield Steeldogs. Just 18 seconds in Sheffield opened the scoring when Lubomir Korhon beat Andrej Vasiljevic and Lloyd Gibson made it 0-2 at 1.24. Sheffield’s clean sweep of the first period was completed by a powerplay strike by Korhon at 15.45. Edgars Bebris made it 0-4 at 22.32 and scored again at 23.57 for 0-5. When Korhon completed his hat-trick at 25.11 Danny Milton made his way on to replace Vasiljevic. Kamil Tvrdek beat Sedlar to open the home team account at 34.49 and doubled his tally and his team’s at 37.08 and the second period ended 2-6. The weather didn’t prevent the Slough Jets from playing host to the travelling Sheffield Steeldogs. The physical element of the game ahead was hinted at by Dan Davies and Andre Payette both receiving double roughing minors after just 6.23 but it was in the final second of Payette’s second trip to the box that the home team opened the scoring with Darius Pliskauskas netting at 16.06 for a 1- opening period. 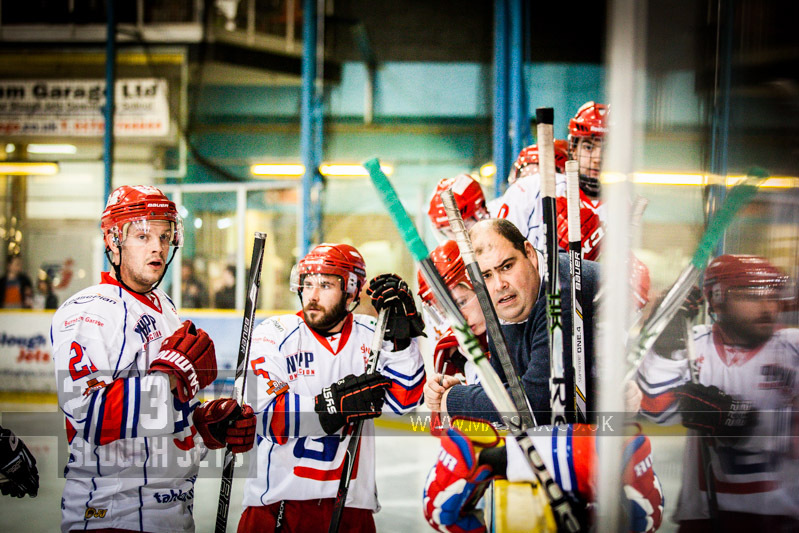 The result was put beyond doubt in the middle period as Slough closed out the win with 5 unanswered goals. Ciaran Long scored at 26.24 and was followed by Tomas Valecko less than two minutes later. Dan Davies made it 4-0 at 33.31 and at 34.35 Valecko found the back of the net for the second time. With just 11 seconds left in the middle period Michael Wales scored to make it 6-0 after 40 minutes. Sheffield replaced their import netminder with Brit Brad Day for the third period and he conceded his only goal at 46.55, a powerplay goal from Frantisek bakrlik. With the score at 7-0 at 47.33 Slough also gave ice time to their back up with Gregg Rockman handing over a clean sheet to Danny Milton to close out. The teams traded one further powerplay each and the game ended 7-0 with Milton and Rockman combining for the clean sheet win. 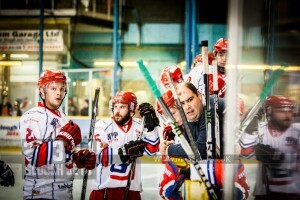 Slough Jets returned to home ice after a disappointing weekend ready to make amends against the Telford Tigers. The home team set off almost straight away with Dan Davies opening the scoring at 2.22 on the powerplay and Adam Calder followed up at 7.33 with another powerplay goal. The third goal came from Calder, this time shorthanded at 10.19 and Greg Blais called the time-out for the visitors. While there was no further scoring the 3 special team goals stood at 20.00 for a 3-0 opening period. The second period saw Slough secure the game but only after Joe Henry had given the visitors some hope with their opening goal at 24.18. Darius Pliskauskas netted at 26.09 making it 4-1 and then followed Calder for his hat-trick at 27.50 with Pliskauskas netting his second at 28.15. Telford had changed their netminder after Calder’s hatrick but Pliskauskas beat him for a second time and brought up his hat-trick at 30.51 making it 7-1. Ryan Watt scored at 34.11 and Pliskauskas netted his 4th of the night at 39.12 to make it 9-1. Slough continued to scored with Aaron Connolly scoring at 44.38 and again at 48.23 making the score-line 11-1 and Tom Devey came on to replace Gregg Rockman in the home team net. The final goal of the game came from Telford at 54.49 with Josh Bruce scoring but the game was already over by then. Adam Calder made his debut in the EPL for the Slough Jets as they lined up against the Basingstoke Bison. Both teams came out fast for the game and exchange penalties before Shaun Thompson beat Dean Skinns at 11.26 to give the home team the lead. The period ended with the teams playing four on four, an indication of the period ahead to come. The second period saw 38 minutes in penalties awarded yet not a single special teams goal scored. Slava Koulikov doubled the lead at 21.41 with a 4 on 4 goal. Basingstoke hit penalty trouble with Ben Davies serving a 10 minute misconduct and soon joined by Chris Wiggins with a 2+10 check to the head. With the period coming to a close Slough snuck in a third goal at 39.59 when Dan Davies found the back of the net. Basingstoke came to life in the third period, started with a Steve Moria goal at 40.41, Viktor Kubenko drew another goal back at 46.00. Kubenko netted again at 49.48 to level the game and Slough took their time-out. Following the time-out Jan Krajicek put the home team back ahead at 51.21. Joe Greener made it 5-3 at 59.18 and Basingstoke took their time-out. Dean Skinns was pulled from the net but made it back in however it made no difference to the scoreline. After playing at Milton Keynes seven days previously it was Slough Jets turn to play host as the Lightning came to town. The teams settled in for a tough game with never more than a goal between them. Milton Keynes opened the scoring at 9.05 with Ross Bowers converting a powerplay but Peter Jasik levelled the balance at 9.53 and the first period ended tied at 1-1. The second period again saw a rapid exchange of goals following the pattern of the first. Milton Keynes killed off a penalty before Slough capitalised on their next powerplay opportunity and Peter Poljacek put the home team ahead. Within 1.09 it was back at even terms when Leigh Jamieson converted just 8 seconds into a powerplay in what was becoming an increasingly physical game. The third period started with Milton Keynes sneaking into the lead 1.19 in through Adam Brittle before killing off the period’s only powerplay. Into the final 10 minutes there was another quick exchange of goals when Poljacek netted his second at 52.26 to level the score at 3-3 but 1.12 later Michael Wales got the game winning goal at 53.38. Slough battled hard to force overtime but were unable to pull the netminder in favour of the extra skater and eventually tensions boiled over at the sounding of the final hooter seeing match penalties handed out to players and the visitors Manager.